We have seen an increasing need over the last 15 years for close collaboration between engineers and surgeons. 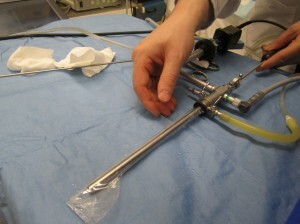 As minimally invasive surgical techniques have gained in popularity, the need for miniaturized and highly customized instruments for laparoscopic procedures has also risen. TMAC has had the great opportunity of working with surgeons and medical device manufacturers over the years, and continues to be involved in the design, prototyping, and testing of surgical tooling. A recent effort has involved fabricating a device, referred to as a percsac, to assist with the capture and removal of kidney stones from a patient. 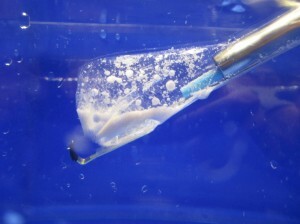 Following kidney stone removal surgery, up to 50 percent of patients will experience a stone-related event. These events can include the need for prolonged hospitalization, readmission, or secondary surgical procedures and can be associated with increased morbidity and cost. The percsac was developed to capture large stones in an enclosed pouch, enabling stone fragmentation without fragment migration. The percsac allows fragmentation of stones measuring up to 3cm with containment of all residual fragments, thereby preventing migration of stone fragments into inaccessible regions of the kidney. TMAC is the official representative of the MEP National Network and NIST MEP in The State of Texas. The MEP National Network is a unique public-private partnership that delivers comprehensive, proven solutions to U.S. manufacturers, fueling growth and advancing U.S. manufacturing.